They don't get much tighter than this. The margin at the end of a thrilling high-speed duel to the line in the Chicagoland Indy 300 was 72cm or 0.0077sec - less than the blink of an eye with Sydney's Ryan Briscoe getting the nod over another driver from these parts, Aussie born but kiwi-raised Scott Dixon. 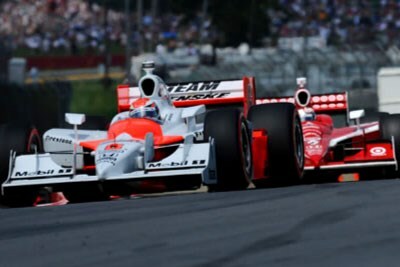 The Indy 300 was a classic oval race with several of the title contenders running three wide up front on many occasions and the result in doubt to the very end. It was the fourth-closest finish in Indy history and so tight that Briscoe didn't know he's won until his team owner Roger Penske congratulated him in the cool-down lap. "Nice," he said. "The side draft just pulled me up there. "I wasn't even sure we had won it. I didn't think I was going to get him." Briscoe, who has finished second seven times this season, has been saying he needed to win races if he is to take out the IndyCar Series championship. This was his third win this year, and at times it didn't look likely to happen. He slipped back to eighth at one stage, and later to 13th in the 200-lap race, but kept fighting. The weekend couldn't have gone better for Briscoe who collected maximum points on the 1.5-mile oval. Along with the big bag of 50 for the victory, there was a bonus one for pole and two for leading the most laps. "The Target cars are going to be there in Motegi and Homestead, so we just have to stay focused," said Briscoe afterwards. "We've had good cars on all the mile-and-half ovals this year. We've just got to keep it together. We had a couple of mistakes tonight, but were able to come back. We've just have to try to avoid those situations." After a stoppage on lap 191 after Helio Castroneves crashed, Dixon led Briscoe and the pair started a titanic scrap for victory with the lead swapped four times over the final nine laps. Briscoe got his front wing ahead on lap 199 and made it stick - at a lap average of 340.14km/h! It was his second successful success in a race photo-finish in four races, the margin very similar at Kentucky on August 2. With just two races remaining, Briscoe has now eased out a useful but hardly secure 25 points lead over Dario Franchitti, who was fourth in Chicago, with a further eight back to Dixon. Championship points: Briscoe 550, Franchitti 525, Dixon 517, Castroneves 383, Danica Patrick 353.